San Dimas Dental Group has been in the community for over 40 years helping to create beautiful, healthy smiles. We strive to provide quality dentistry in a comfortable atmosphere and to make each patient feel like they are being treated the same way a family member would. We pride ourselves on maintaining the highest level of ethics, keeping the office up to date, and keeping current with continuing education. We aspire to stand apart from the average dental office and hope to make each and every patient's experience a positive one. In recent years, there has been a significant growth of corporate-owned dental offices. They go to great lengths to deceive you; with staff often being on commission and a lot of unethical over-diagnosing of unneeded dentistry. These practices often offer specialty services in one location as opposed to referring patients out. Now on a more positive note…we have taken the model that many corporate-owned dental offices use and put our own spin on it. For your convenience, you will still see the familiar faces of Drs. Bunkers, Savani, and Brar but we also have one new exciting change! We now bring the specialists to you! Roots canals, gum surgeries, braces, and implants can be done in-house. The big difference is that we will not ever diagnose unnecessary treatment or hard sell our patients. Our vision is to have a multi-disciplinary practice while still retaining good old-fashioned ethics. To learn more about any of our doctors and the services they can offer click here. In the last few years we've added some extraordinary equipment to the practice. The CEREC machine allows us to fabricate beautiful, lifelike crowns in a single visit and the Galileos is a 3D cone beam imaging device. 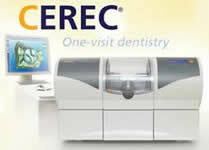 We are proud to offer our patients this cutting-edge technology in our office.